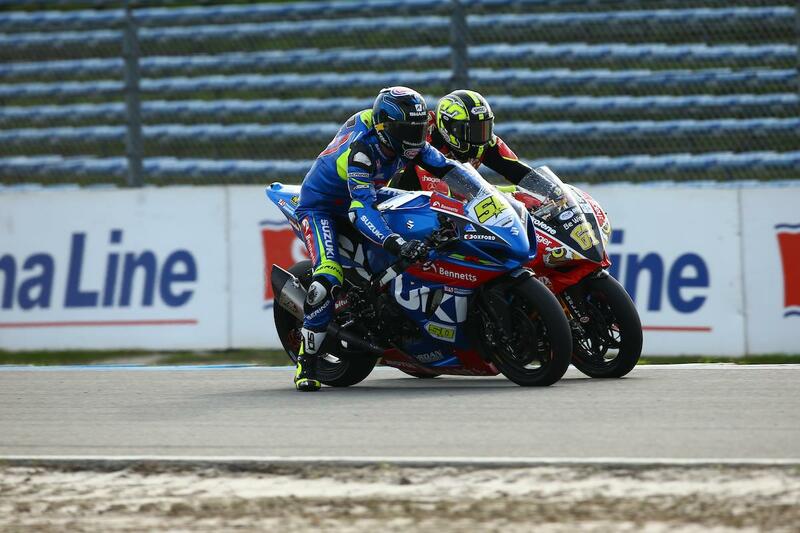 Sylvain Guintoli took a debut victory for the all-new GSX-R1000 in an epic second MCE British Superbike race at Assen this afternoon, coming out best in a five-bike battle for the lead. Guintoli, Leon Haslam, Shane Byrne and James Ellison all led the race at points, with the Anvil Hire TAG Yamaha of Josh Brookes close in tow. It was Shane Byrne who led most of the race as he looked to reignite his championship fight, but when Ellison overtook him and the duo began scrapping for the lead, the pack behind closed in and a titanic battle ensued. The race-winning moves would come when the four leading riders were neck and neck at the braking point for turn one, with Haslam and Byrne letting off the brakes to try and take advantage. However, both title fighters ran on. Byrne came off the worst, re-joining in fifth but it was Guintoli who took advantage at the front to build a gap on the four riders behind. The Frenchman’s win was his first since 2009 after a challenging year with the Bennetts Suzuki team. Brookes was also able to take advantage of the turn one melee to finish second and re-gain second in the series standings, with Haslam completing the podium ahead of Ellison and a devastated Byrne. Peter Hickman finished a distant sixth ahead of fellow title-fighter Jake Dixon, and although both remain within a mathematical shout of the title it’d take a minor miracle. Christian Iddon finished eighth ahead of Dan Linfoot while Bradley Ray rounded out the top ten. Haslam now leads the series standings by a commanding 32 points over Brookes with Byrne a further point back in third with three races remaining at Brands Hatch.